On 24th February, the Right Reverend Mike Harrison, who is the Chair of the UK Friends of CRS, was ordained and consecrated Bishop of Dunwich in the St Edmundsbury and Ipswich Diocese. 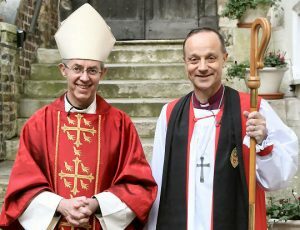 The service took place in Westminster Abbey in London and was conducted by the Archbishop of Canterbury (pictured left with Mike), supported by other bishops. It was a magnificent and moving occasion with the Abbey filled nearly to capacity. The ordination and consecration ceremony was interwoven into a service of Holy Communion, with the Eucharist as its crescendo. The UK Friends join in wishing Bishop Mike every blessing in his future ministry.